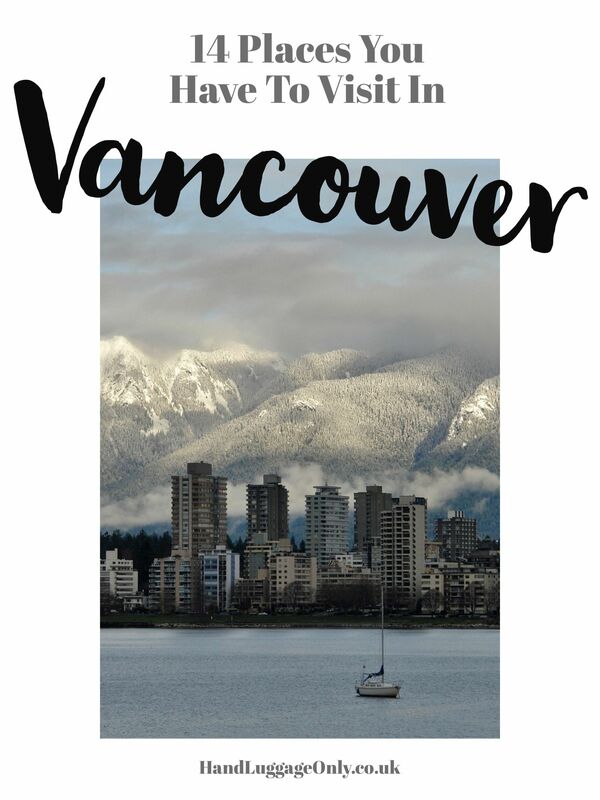 As I’ve mentioned (and perhaps far too many times), Vancouver is the first place I ever visited in Canada and the place that made me totally fall in love with Canada! There are very few places in the world that make you feel at home as soon as you step foot in them and Vancouver is one of those special places. It’s a strange thing really because as amazing as cities can be, their appeal is usually more to do with the diversity of amazing sight to see and although Vancouver has amazing sights to see in spades (we’ll get to that below very soon), it has that extra special appeal that you tend to find in villages or small towns of just being so welcoming, uber-friendly and very homely! 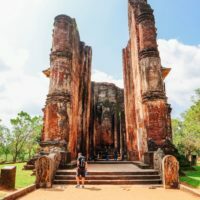 My favourite part of the city of course is how immerse into nature it is – you don’t have to walk too far before you find some amazing park, jaw-droppingly beautiful mountains and even beaches (not something you immediately think of when you think of Canada). 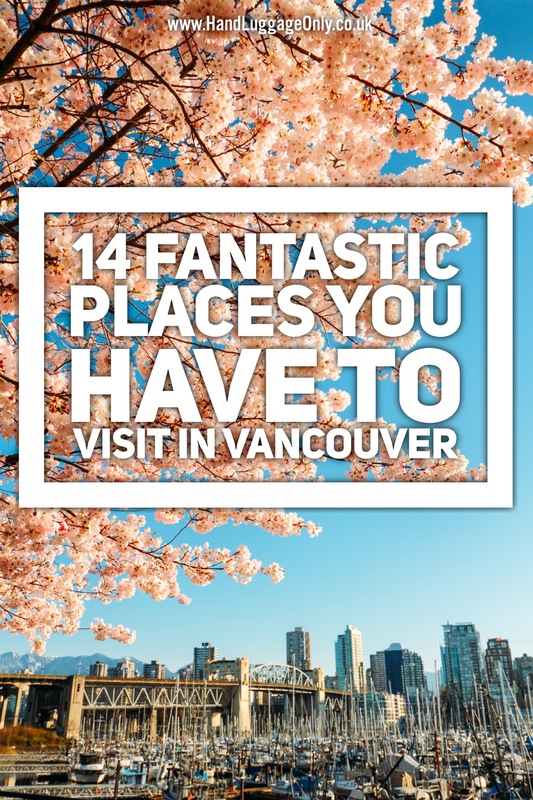 Okay, with my obsession and fascination with Vancouver, here are the 14 places you have to visit when you find yourself in Vancouver! 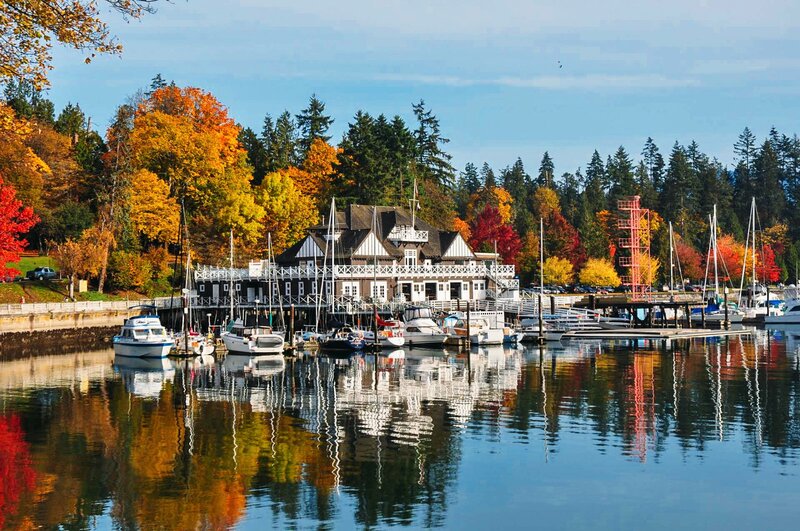 Vancouver’s first official green space, Stanley Park is a massive and stunning park just north of the downtown area, almost entirely surrounded by the sea. Visitors to the park will find a few surprises (along with some old staples) in the park like the Stanley Park Train… or the horse-drawn carriage rides (if you’re into that, of course). You also won’t be stuck for places to eat and drink and there are a fair few cafes and restaurants around the park – otherwise, you could just bring your own picnic with you. 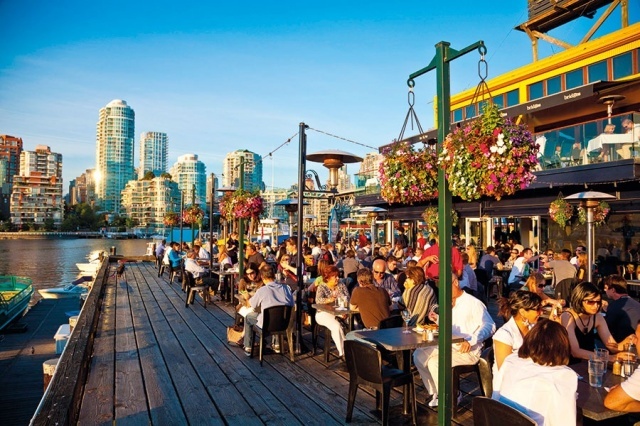 Situated just south of the downtown peninsula, beneath the Granville Bridge, is a favourite for locals and tourists alike. Granville Island, which was once home to many of the city’s factories and sawmills, now houses a Public Market, as well as theatres, craft studios, and artisan workshops. The market is the perfect place for finding tasty treats, while the rest of the area is great for finding unique souvenirs and specialty items. The best way of getting to the island is by taking the mini-tugboat ferry that crosses at False Creek. Step back in time to 15th century China at the Dr. Sun Yat-Sen Classical Chinese Garden. 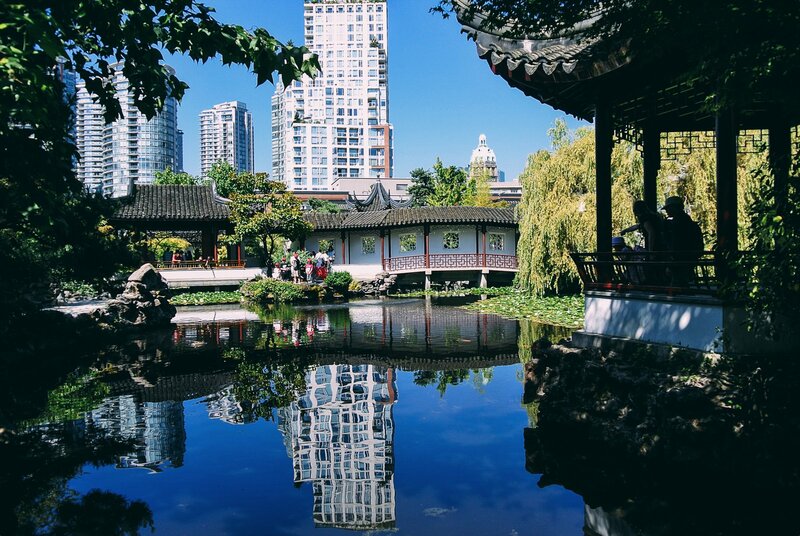 This beautiful and almost otherworldly garden is the first of its kind outside of China, allowing the people of Vancouver a chance to more fully explore Chinese culture. Built between 1985-1986, the Chinese Garden takes its inspiration from scholars’ gardens of the Ming Dynasty, with both Chinese and Canadian workers helping to create the space. Guided tours are included with the price of admission, and there are always different exhibits available for viewing. At the end of your visit, enjoy a cup of tea before perusing the wonders of the Eight Treasures shop (Lloyd is a sucker for gift shops – we’ve even had to visit the gift shops for places we never actually visited, don’t ask why or how…:-) ). Located just north of Stanley Park is the Capilano Suspension Bridge. 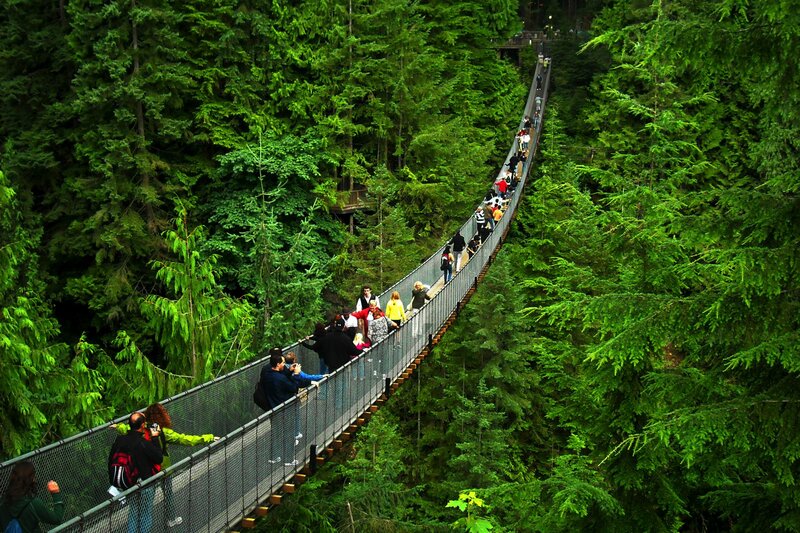 Take in the fresh forest air as you walk across the suspension bridge that takes you across the Capilano River. Trust me, this sight from up on the bridge is rather impressive and even if you’re slightly wary of heights, it’s still worth giving this a try. The bridge is 460 feet (140 m) long, and sits at a height of 230 feet (70 m) above the river. 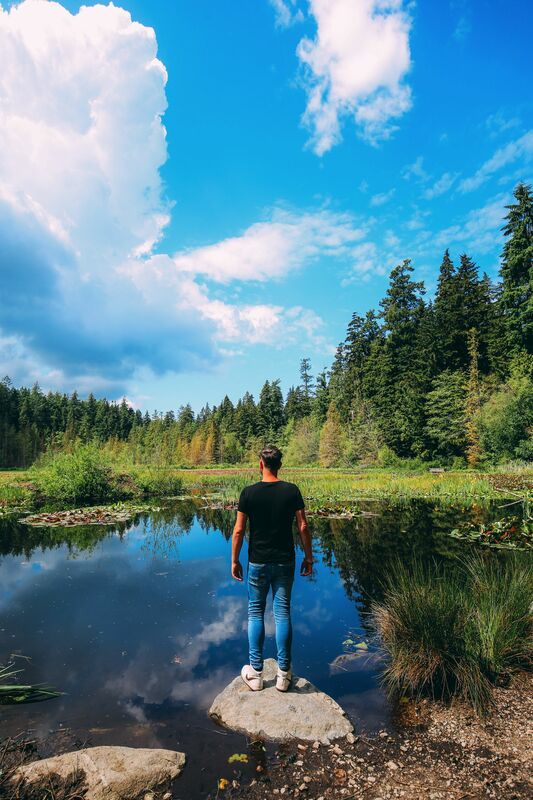 Once you’re done crossing the suspension bridge a few times you should definitely pop into the Capilano Suspension Bridge Park to further immerse yourself in that stunning natural Canadian beauty! Just on the edge of downtown, English Bay Beach, also known as First Beach, is the most popular beach in the city! 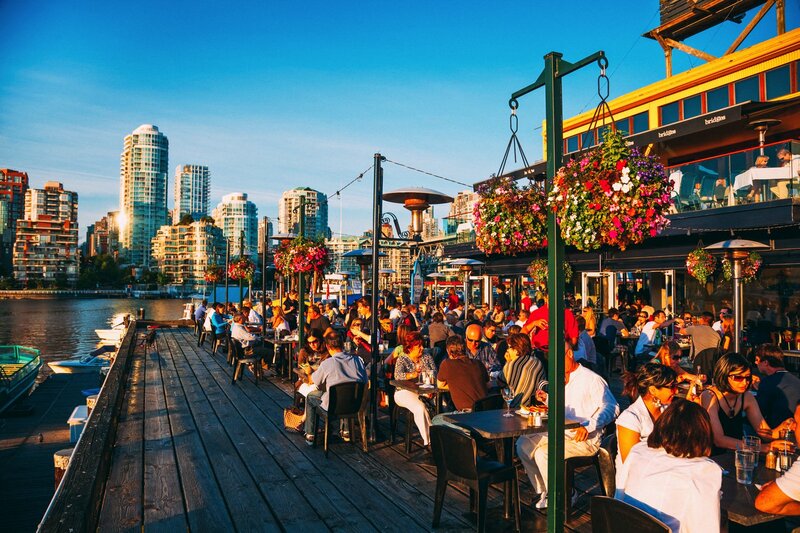 While beaches might not be the first thing that comes to mind when you think of Vancouver, don’t let that stop you from checking it out! 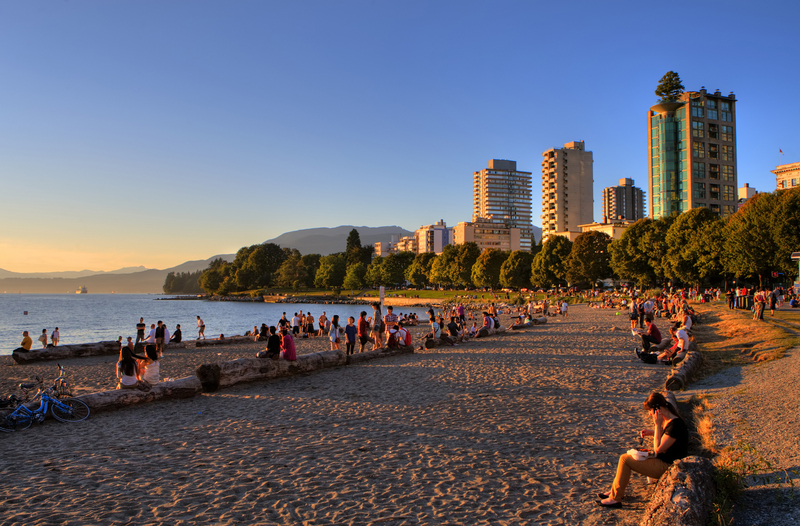 With the Stanley Park Seawall running along its east side, and the beautiful English Bay to the west, the beach is bound to please anyone looking hoping to sunbathe, play volleyball, or even look for whales (albeit perhaps much more so in summer). There’s also an array of cafes, concession stands, kayak rentals, volleyball courts and even a swimming raft with a giant slide. If you visit in the winter, try to make it for the Polar Bear Swim that occurs on New Year’s Day. A building that has become an icon for the city of Vancouver, Canada Place is essentially THE place to go for all things, well…Canada! 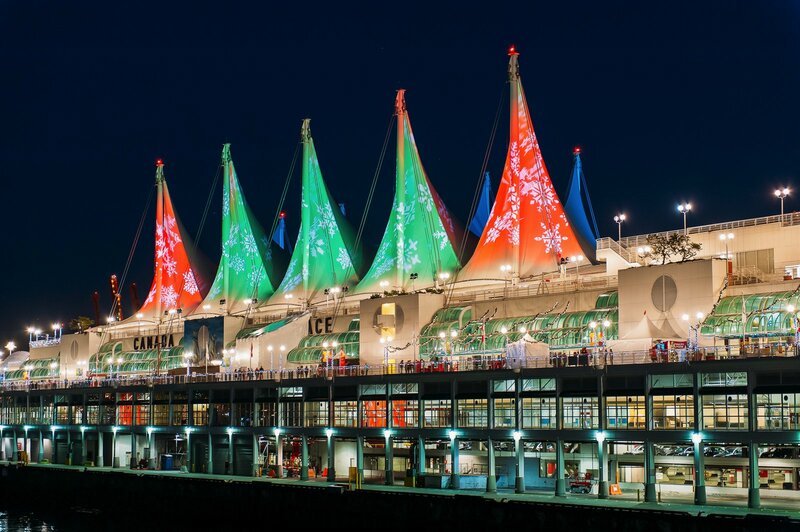 Both a convention centre and a ferry terminal, Canada Place is the site of many events that happen in the city. 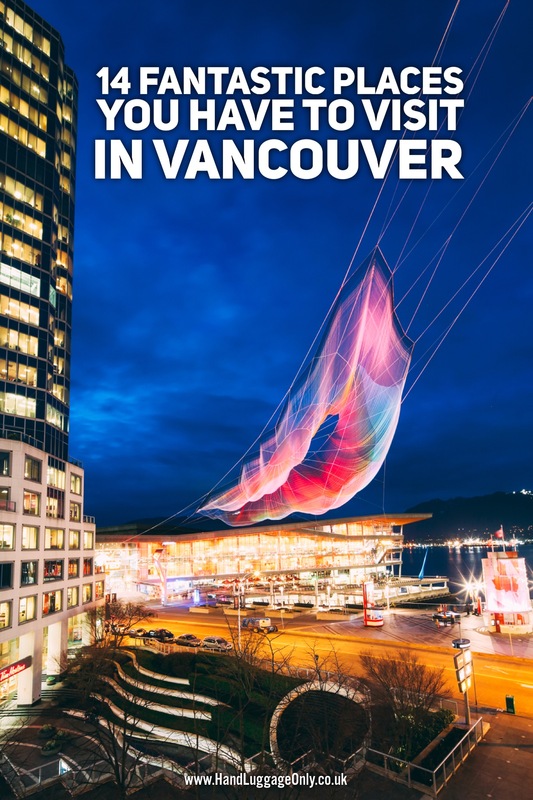 Located right on the water of Vancouver Harbour, visitors can enjoy The Canadian Trail, an interactive walking trail that allows visitors to see all different areas of Canada represented. Guided walking tours are available as well as the Sails of Light show happens every night. 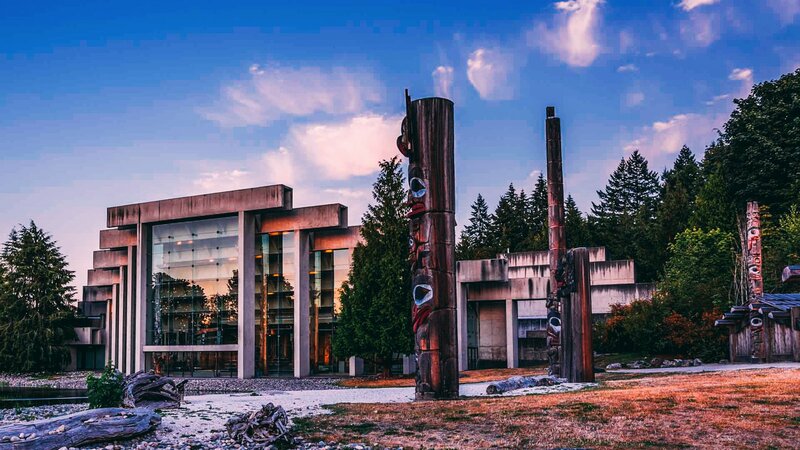 Located at the University of British Columbia, the Museum of Anthropology is world-renowned for its displays of arts and culture, particularly those of the First People of Canada. In the Multiversity Galleries, over 16,000 objects are on display for visitors to enjoy, and the works of Haida artist Bill Reid are also found at the museum. The focus here is really on the cultures of the Natives of the Pacific Northwest, as visitors can come face-to-face with traditional Haida houses and Musqueam house posts around the museum grounds. The focus here is really on the cultures of the Natives of the Pacific Northwest, as visitors can come face-to-face with traditional Haida houses and Musqueam house posts around the museum grounds. Anyone with even the slightest interest in science is going to have a blast at Vancouver’s Science World. Now officially known as the Telus World of Science, the institution has both permanent science displays as well as fascinating exhibits. Many of the displays are interactive, and an OMNIMAX Theatre is also on site. 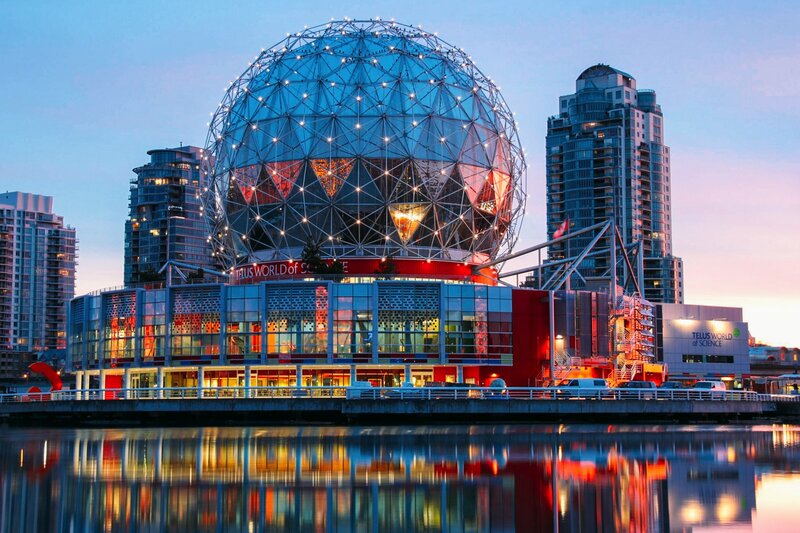 Located to the east of downtown, Science World is an easy favourite for adults and kids alike! 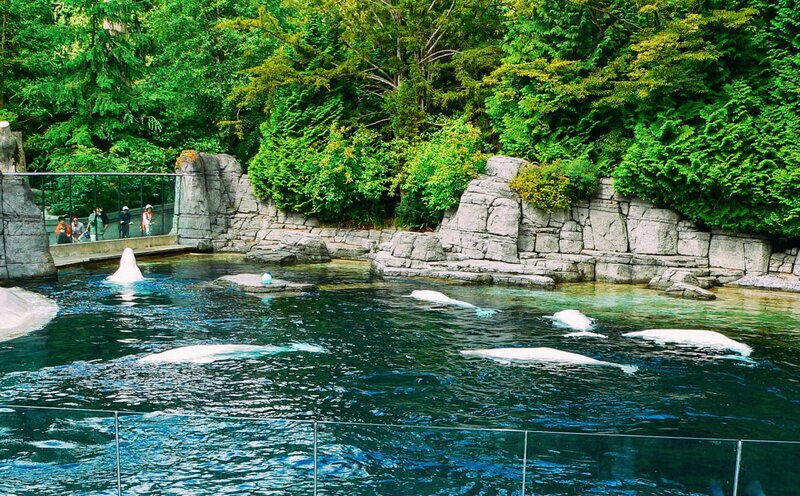 Located in Stanley Park, the Vancouver Aquarium is Canada’s largest aquarium and was also the first public aquarium to open in the country. Since 1956, the Aquarium has been educating and entertaining visitors with its 70,000 sea creatures, with over 1 million visitors stopping by from around the world each year. Exhibits range from beluga whales to endangered frogs and Arctic animals – visitors can even feed and play with the beluga whales, sea turtles, dolphins, sea otters and sea lions! An IMAX theatre is also on site, with 4D nature documentaries being shown if you’re just looking to rest your legs. 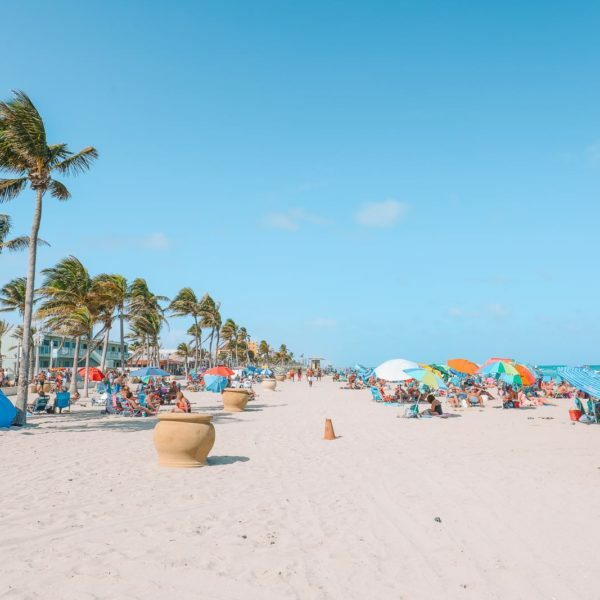 Suffice it to say, there’s just so much to see and do here that you could easily spend an entire afternoon at the Aquarium. 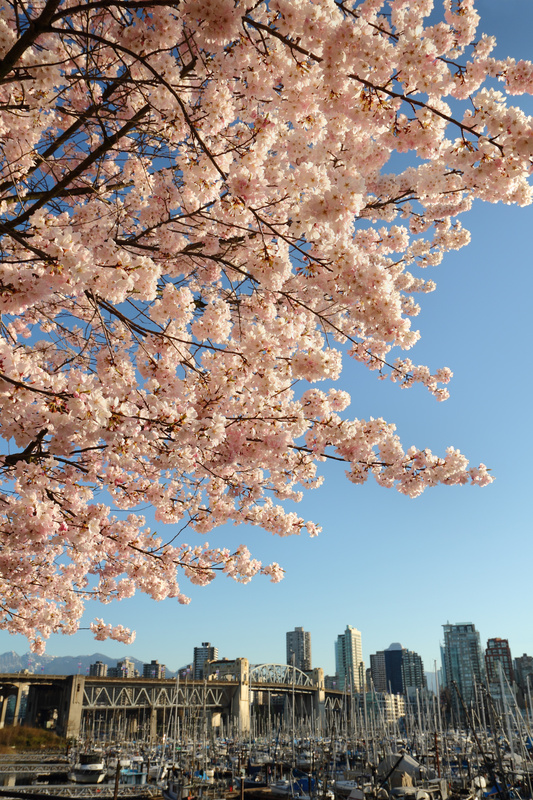 Just because Vancouver is surrounded by some of the world’s most stunning natural beauty doesn’t mean you should come to expect nothing beautiful indoors too. 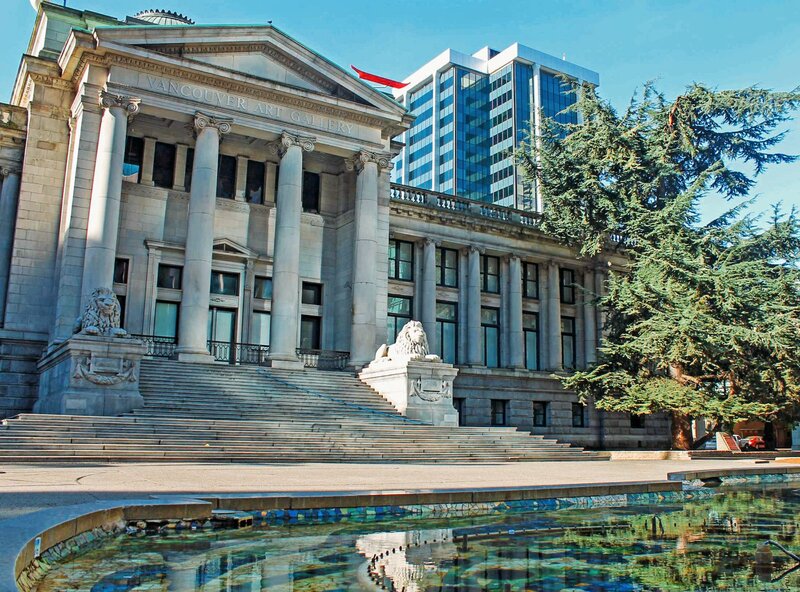 😉 The city’s Art Gallery, located in downtown Vancouver, is home to over 10,000 art pieces, ranging from Canadian and British paintings to the photographic works of artists like Ansel Adams and Henri Cartier-Bresson. Guided tours are always available, but for something both interactive and slightly different, try to make it for a FUSE event, where DJ’s and artists perform throughout the galleries from 8 pm to 1 am. For all things truly Vancouver – including the past, present, and future, head over to the Museum of Vancouver. 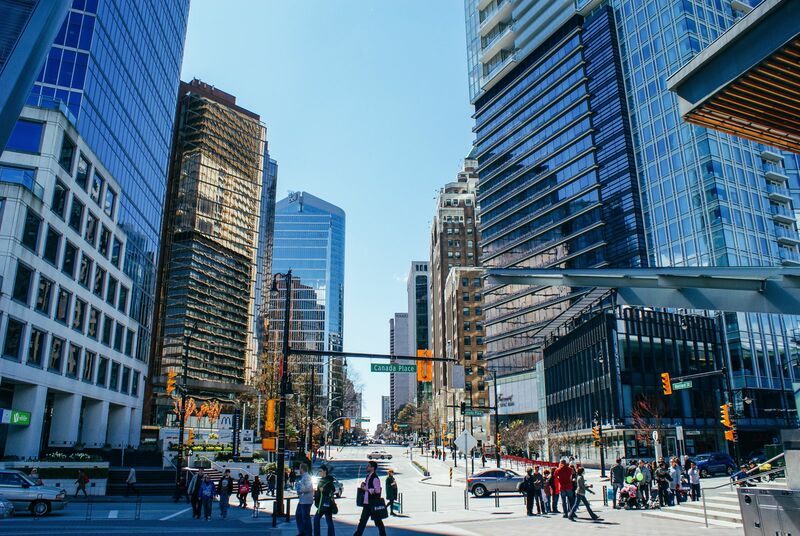 Here, visitors can learn all there is to know about the city, starting from the ancient times and lifestyles of the Musqueam people up to present day city life in Vancouver. Located in the scenic area of Vanier Park, the museum is easily accessible from downtown. 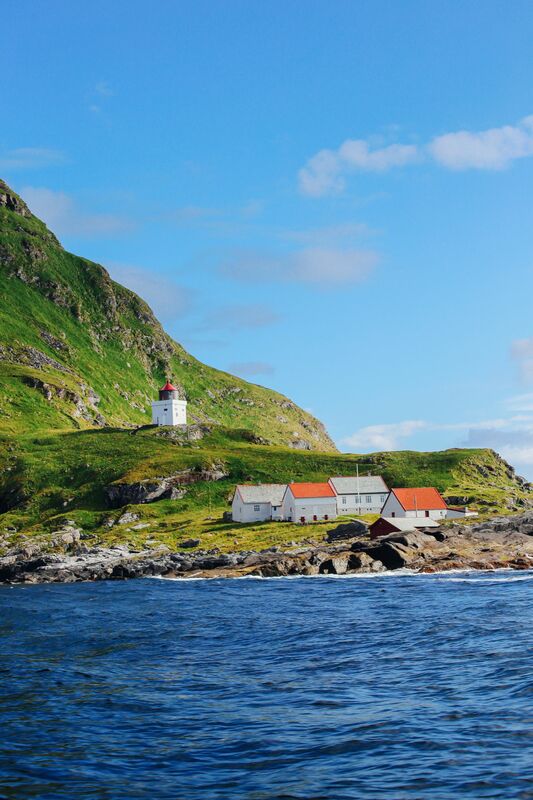 The closest mountain to the city is only 20 minutes drive away! 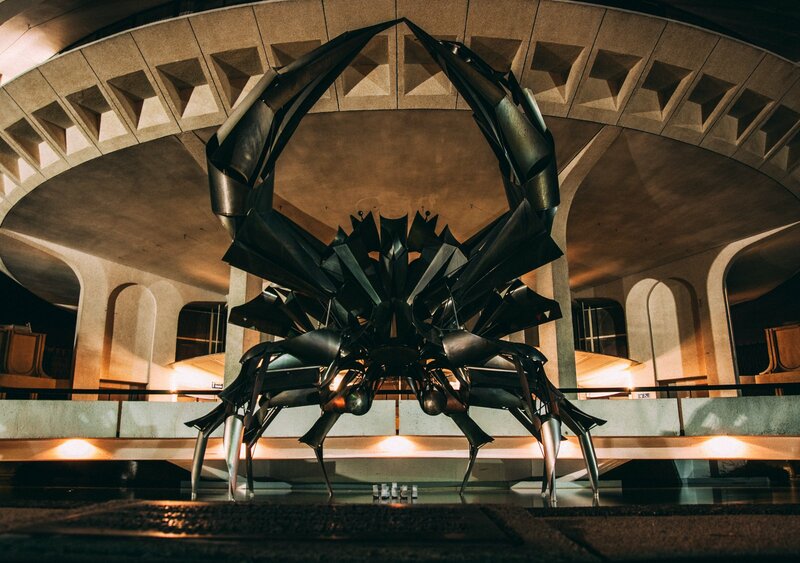 I remember the first time I saw it from the city and after several days of wondering what it was, I finally decided to pay it a visit. This is how amazing Canada – while back in town it was t-shirt weather, up on Grouse mountain, people were skiing and it was actually properly snowing! Best of both worlds, right? 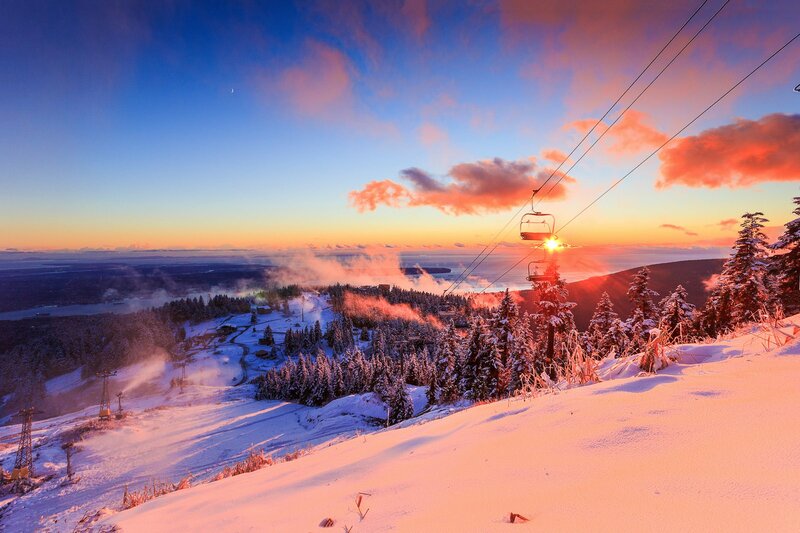 Grouse Mountain also has North America’s largest aerial tramway – the Skyride. The Skyride takes visitors up 3,700 feet (1,128 m) to the Alpine Station, where skiers and snowboarders have 26 different ski runs to choose from. 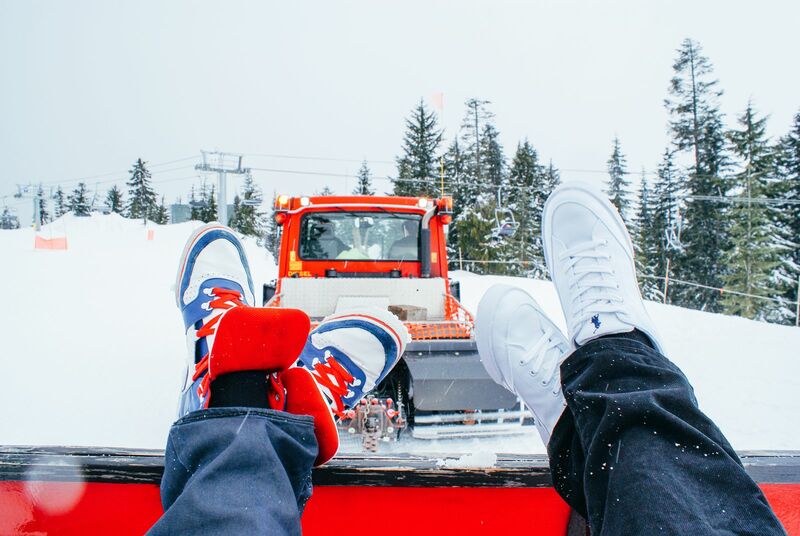 Whether you’re a beginner or a pro on the slopes (or perhaps you just want an incredible view) Grouse Mountain is a must see in Vancouver. 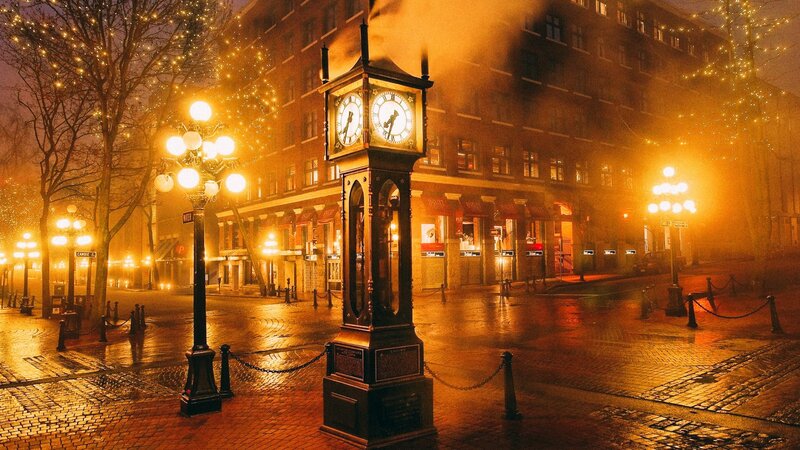 Despite the slightly odd-sounding name, Gastown is the oldest and one of the most beautiful neighbourhoods in Vancouver. Old Victorian houses are the setting for trendy fashion shops, gorgeous boutiques and some of the best food in the city. The neighbourhood can be found on the north side of downtown, between Richards Street, Main Street and Hastings Street. 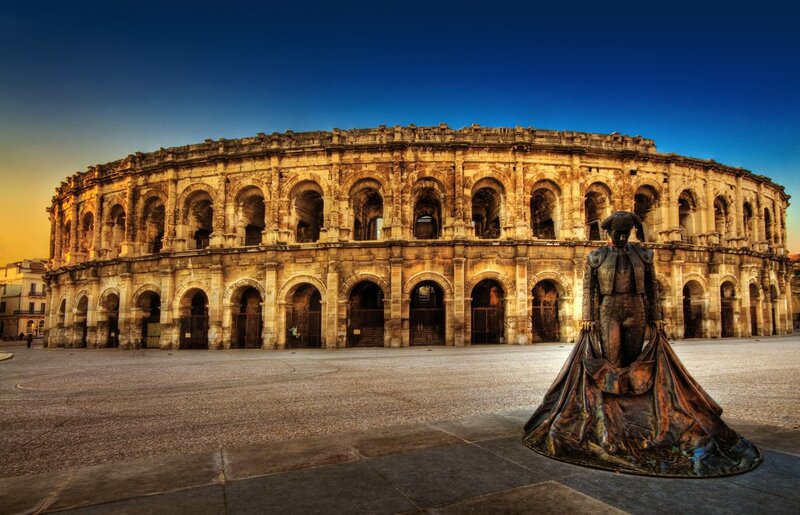 The cobblestone streets, old buildings, vintage lamp posts and the Steam Clock are all best explored on foot. The coast of Vancouver is the perfect place to go whale watching! 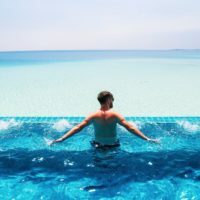 There are plenty of options to do so here too! 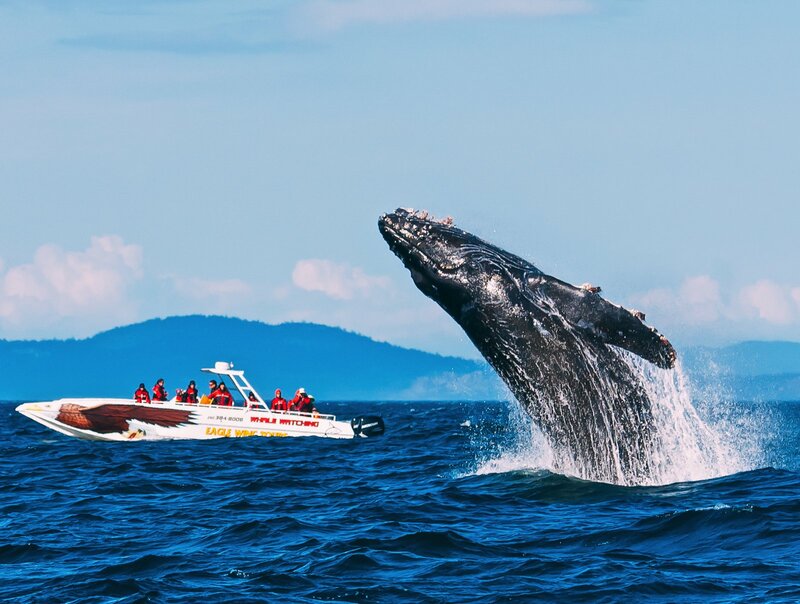 Every year between March and October, whales migrate through the waters near Vancouver, meaning there is a good chancing of spotting one on your trip. Don’t forget about the other creatures of the ocean! Other than whales, expect to see dolphins, sea lions, sea otters and various birds on your excursion.